I rarely buy The Sunday Times, a British newspaper with as many sections and supplements as Joseph’s coat had colors. It is an unwieldy journal to read, about as convenient as riding a bicycle in an airplane. I bought it the other day, though, and as usual admired the consummate skill with which its editors manage to pack so little into so much space. It requires a certain ingenuity and brazenness (as well as advertisers of everything from holidays in Croatia to stair lifts for the elderly) to fill so many pages every week. His face took me back a few years to when I was what might be called the vulgarity correspondent for a British newspaper that shall be nameless. When it came to vulgarity, this newspaper faced in more than one direction: In theory it was against it, but in practice it actively promoted it, thus getting the best of two readerships. As vulgarity correspondent I was sent wherever, at home or abroad, British youth gathered and behaved unattractively”which, of course, was more or less anywhere it gathered. They sent me to Glasgow to see Liam and his brother Noel perform. This was the second pop “concert” the newspaper had sent me to. The first was by an act so horrible”the “artists” urinated over the nearest members of the audience and repeatedly addressed it as “you motherfuckers””that the council of a town repeatedly voted as one of the worst in England (where the competition for the title is exceedingly great) had banned them from appearing on a municipal stage. Their music sounded to me like a perpetual car crash; their language combined banality with extreme offensiveness; and I was surprised to see that many middle-class enthusiasts so desired to be insulted and urinated over that they brought their 6- or 7-year-old children with them to witness it. I suppose they couldn”t get babysitters for the night. As a member of the press I was given special treatment at the Gallagher concert, the main point of which special treatment was the handing out of earplugs. I asked the publicity staff for the Gallaghers whether they did not think it odd that they should hand out earplugs to reduce the volume of a musical act, which surely was something above all to be heard; but this was a world in which, while superficial defiance or insolence was de rigueur, irony was evidently in short supply. The earplugs were insufficient to prevent ringing in my ears after I left (which I did the moment I thought I had enough material”my leaving was more like fleeing, really, and I didn”t stay long). The whole act had seemed to me a minor manifestation of the great overriding, and indeed only, ideology of modern Britain, namely militant vulgarity, that is to say not vulgarity that is spontaneous, but vulgarity that is deliberate, planned, and evangelical in its fervor. 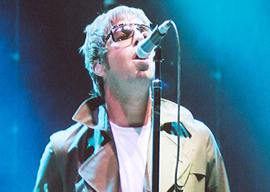 Liam Gallagher is now 44 years old and therefore no longer a youth, as he was when I saw him on the Glasgow stage (erected in a giant exhibition hall). I was mildly curious to discover how far he had evolved in the meantime and read the interview with him. What are the interesting things he has to say, then? This is obviously a matter for him of self-congratulation, of authenticity; only boring, inauthentic florists don”t assault their customers for no reason whatever.